We’ve spent very little time talking so far about one of the most important parts of the 5 gallon bucket – its handle. I know from my experience that the handle is of critical importance, because I’ve broken them before. You don’t realise how much you rely on that handle until it’s suddenly unusable. Now for an all-plastic handle, really the only thing that you can do is replace it. You can see that the taping job we tried on this one did not hold. My bucket supplier is a soap retailer who breaks so many handles that he orders them in by the box. That’s why for a handle that lasts, metal handles are the way to go. Metal handles like on this laundry detergent bucket come with pathetic plastic grips. They barely last a year before they start to split and eventually fall off. 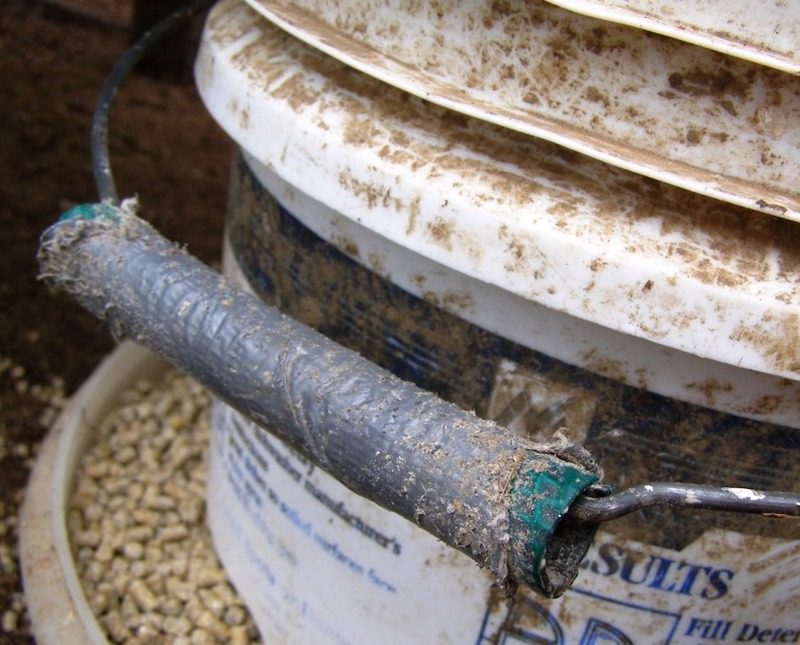 You can imagine that carrying heavy loads around with just that thin metal handle is painful on your hands, making the entire bucket far less useful. 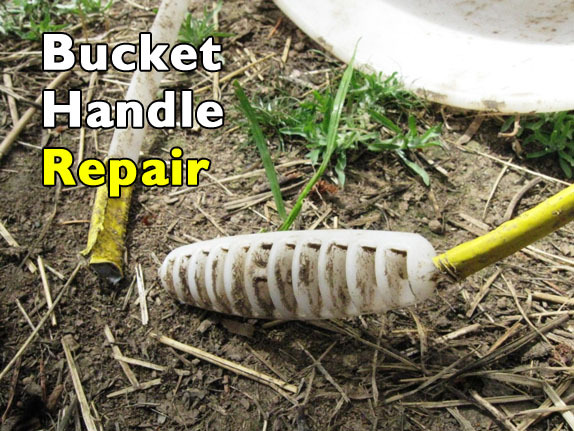 Since we regularly use every single bucket we own, we need these soldiers up and working again as soon as possible, so this is a quick tutorial on how to do a bit of field medicine on your bucket handles to get them right back up to fighting shape quickly! We have yards upon yards of spare broken hose, which we pick up free from curbs all over the city. A few years ago Victoria increased citywide water pressure to pander to a bunch of wealthy elites with hot tubs. That’s when people’s hoses started to explode with shocking regularity. People leave these damaged hoses out on their curb, where is where I happily pick them up whenever i find them. 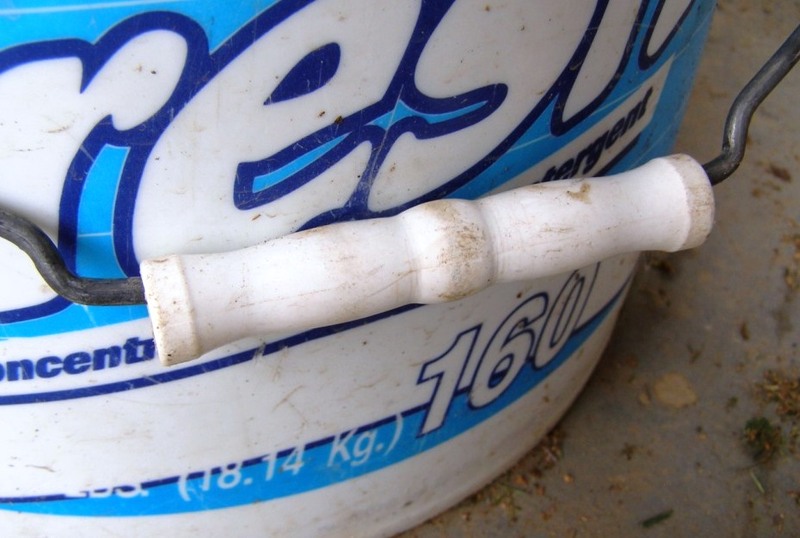 If you don’t have hose, you should be able to use vinyl tubing, which is pretty cheap per foot. Vinyl tubing is commonly used for homebrewing and is available at any hardware store. 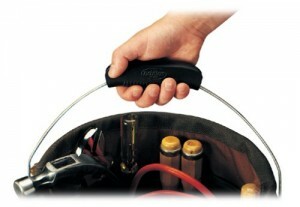 Measure the correct amount of hose that will fit both the flat part of your bucket handle and your hand comfortably. Cut that segment off with your knife or scissors. 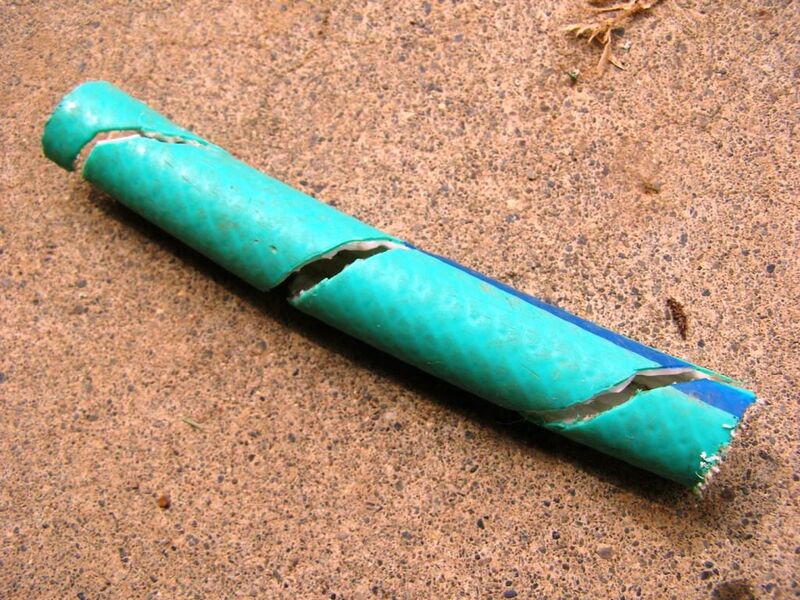 For the strongest handle, you want to cut your length of hose in a spiral. If you do a straight and easy cut, your handle will split easily as soon as you put any strain on the seam. Cutting in a spiral distributes that stress much better. 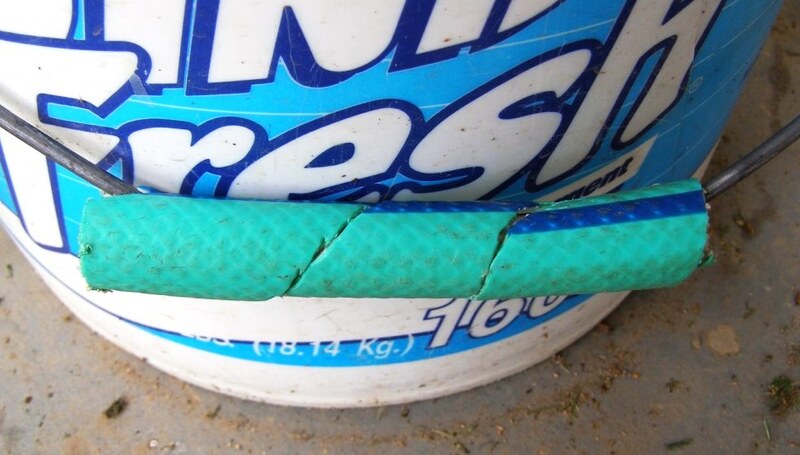 Weave the spiral cut hose segment around your bare metal handle and wrap a couple layers of duct tape around it to secure everything in place. Finished! This is a bucket handle that we repaired on a bucket chicken feeder years ago. You can see how filthy and worn it is now – but it’s showing no signs of coming off! It’s still holding just as strong as the day we made it. Unlike wimpy plastic grips, hose is designed to be both durable and flexible, so we’re pretty confident that these handles will outlast the buckets themselves. 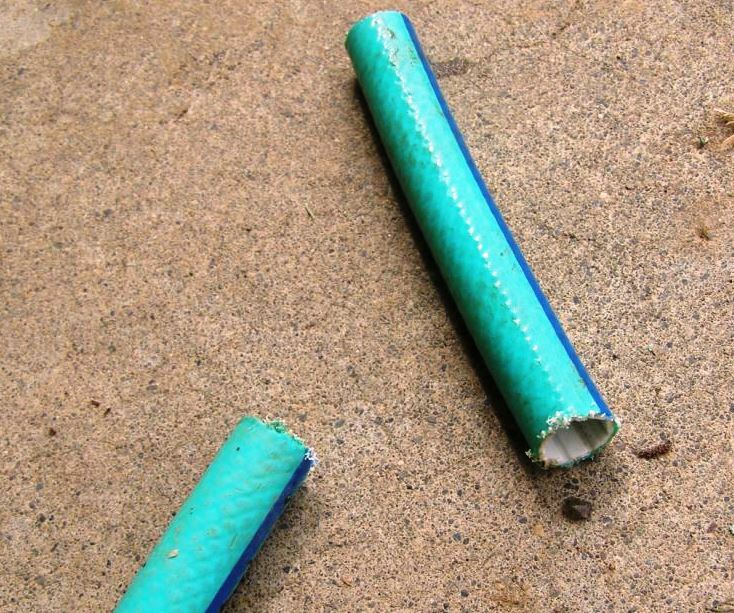 You can try repairing any other handles with hose too! For example we’ve used spiral cut hose to replace worn out bicycle grips, and to strengthen a tow bar for a garden cart. Find out more about the the bucket handle and multitool on our Bucket Multitool article. This is awesome. We use 5 gallon buckets for the Humanure composting system. I was just resigning myself to getting tougher hands as the plastic grips are starting to go, one by one. My hands thank you. Where can you buy replacement plastic handles? The buckets that start with plastic handles won’t accept metal replacements. I need about 300 plastic handles, and can’t find where to purchase them. Dang! I don’t know off the top of my head but I’ve seen boxes of these at a friend’s soap business so I know you can get them. Try getting in touch with Wes at the Soap Exchange and ask him where he buys them. Tell him Trevor sent you. I can supply you with all of the handles you need. You can see our product and its uses on our website. The old hose idea is great, unless you don’t have a hose. Myself I take an old rag or two. fold them, and fold them again around the handle and duct tape them. Works well. I use a short piece of 1/2 inch white pvc pipe. I wrestle on end of the metal handle off the bucket and slide it on then return the metal handle. Use long pliers or channel locks to get leverage. I will try putting the piece of garden hose on that for cushion. Cool site. I use a bucket w seat for hunting and fishing. Storage and a seat that doesn’t snag in the woods. I use a bucket with a tool caddy and found that the original handle broke when the whole wire pulled out due to the weight of the tools. I replaced the metal handle with a piece of wire rope threaded through the original holes that I drilled through the bucket. I threaded the wire rope through a 6 in. piece of 1 in. poly-carbon rod for the grip (dowel would work). It’s nearly indestructible and comfortable. Now if I could only fix the weight! Does anyone know where I can purchase replacement wire handles for 5 gallon buckets at a reasonable price including shipping costs? Since I can purchase a new bucket at Lowes for $3, to make financial sense the handles would need to come in at around $1. If you were to try and find a replcement wire handle for a 5 gallon plastic bucket locally, what type of retailer might you check with?